prior, that many open file shares existed. 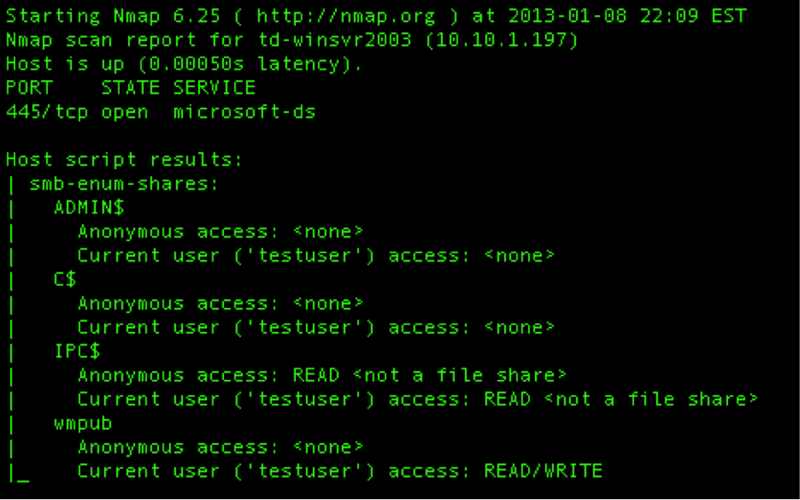 identify SMB file shares that do not require any authentication. account, but without any departmental specific access. but also provides something a bit more – the access to the file share. what we need out of the normal format. account, excluding SMB shares that are not actually file shares. extract the SMB shares with anonymous access just needs a minor change. need access have it, and only have the level of access required (e.g. Read vs.
scans to help identify new file shares that are not properly restricted. Spider tool can be found at http://www2.cit.cornell.edu/security/tools/spider-linux.html. tony@secureideas.com or visit the Secure Ideas – Professionally Evil site for services provided.